The local council in the suburb of Brasschaat, north of Antwerp in Belgium, near the border with the Netherlands, has purchased a QSC Core 250i-based Q-Sys system with a TSC-3 touchscreen controller and QSC KLA line array loudspeakers as part of the audio system in the multi-purpose hall at the heart of its local cultural centre. 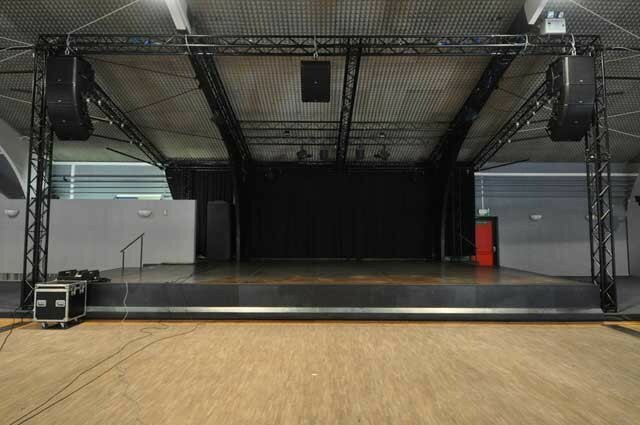 The hall and its raised stage is used for everything from public meetings to children's parties and concerts by local musicians. The staff that run the sound system in the hall are direct employees of the council and recommended the purchase of the Q-Sys system along with the KLA active line array system following a demo by the local QSC distributor, AED. 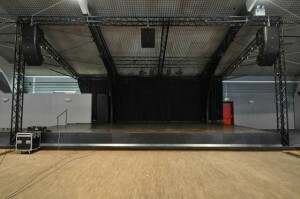 The sound system in the multipurpose hall is configured as a three-channel left, centre, right (LCS) system. Two KLA12 elements are used per channel (for a total of six enclosures), and are combined with four KLA181 subwoofers. “The Q-Sys Core 250i just makes the control of the speakers easier when they have to be reconfigured,” explains Rudy Gaspard, AED product specialist. “The speakers are configured in a very different way when a DJ comes in to play a set than when they're being used as a PA for children's entertainment or as a band PA, for example — not just in terms of whether subs are used and how many, but also in terms of voicing.” Numerous configurations are stored in the Core 250i and can be recalled or reconfigured with the TSC-3, which is located backstage in a rack with the Core 250i. This allows users of the system access to level controls and settings for the different speaker setups and tunings. "Most audio routing systems don't cope with multi-channel assignability very well,” continues Gaspard, “but Q-Sys was easily configured to drive the LCR system. The technical staff at the centre liked our demo very much, and soon realised the capabilities of Q-Sys following its installation.” Since AED supplied the system, the staff at the centre have also attended a course of Q-Sys training with QSC European Technical Specialist Martin Barbour, and learned how to customise the system and add extra functions. According to Gaspard, the centre is now trying to obtain funding from the county administration for an extra I/O Frame, so that Q-Sys can be used for paging and announcements throughout the centre.